At what club do you train? I train at Basildon, Chelmsford and Harold Hill. I started training when I was 11, it will be 9 years ago soon but it seems much longer than that. Why did you choose Ju Jitsu over other martial arts? My brother joined first and I watched him have fun every week and soon after I took my first step on to the mat. I wanted to know how to defend myself and that's what Ju-Jitsu is about. Did you do other sports/martial arts before Ju Jitsu? I used to do gymnastics before Ju-Jitsu and anyone that knows me will understand that I wasn't very good because I have no balance!! I have also done swimming and netball but Ju-Jitsu is my real passion. Tell us about your first Ju Jitsu class. I don't remember much apart from the fact that I had lots of fun!! After all I'm still having lots of fun today! When did you think about getting your Black Belt? Most people say when they first joined, but honestly I only started to think about it once I got my brown belt and even then I still needed a push from Sensei Ian. Was it difficult to attain? It was a lot of hard work but well worth it in the end. You don't realise it until you start training for your Black belt but you have actually been training for this since the first time you stepped on to the mat, well I didn't anyway! 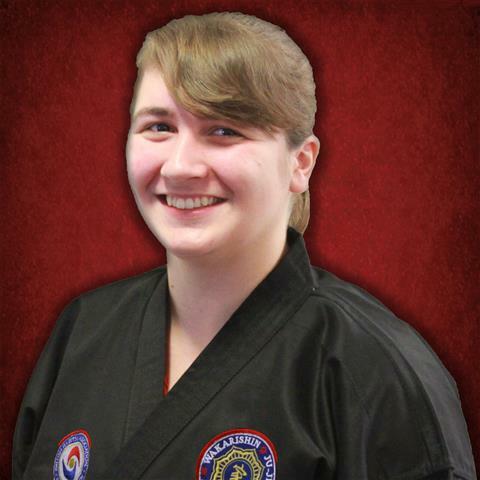 What does a "black Belt" mean to you? To me it shows the dedication and commitment needed within Ju-Jitsu. Achieving myBlack Belt was one of my proudest moments and it will be with me forever. Ever had to use Ju Jitsu for real? Do you enter martial arts competitions? Yes I do, I have lots of fun competing and it has given me the opportunity to competein other countries. We're such a big family that the atmosphere is great wherever we go. Has Ju Jitsu changed your life in any positive or negative way? Ju-Jitsu has had a massive positive impact on my life. It's helped me with my GCSE's, A Levels and it's now a major part of my University course. But most of all it's given me confidence and a new group of friends and I'm proud to say that I belong to such a special team. What do you see as the advantages of Ju Jitsu? There are too many advantages to list, I'd be here forever, but what I can say is that each person's experience is personal to them and the only way for you to find out what advantages it can give to you, is for you to come along and it give a try yourself! How much time does your training require? As much time as you are willing to put in to it. If I had it my way I'd be on the mat everyday! If you could advise a beginner on one thing about Ju Jitsu what would it be? Just have FUN! and try to get the most out of each lesson as you can, we don't bite.